There are a few sights in the world that can take your breath away and leave you speechless … Uluru in the Red Centre of the Australian outback, is one of those places. Whether your first glimpse, like mine, is from high above as the plane comes in to land, or maybe at sunrise on the distant horizon or perhaps from the back of a docile camel, you will very likely feel a strange sense of awe and incredulity at this enormous domed rock thrusting up out of one of this planet’s most inhospitable environments. On the flight from Darwin via Alice Springs I’d been fretting about whether this iconic (yes, one of the few places that truly do justify the use of that word) place would disappoint. For as long as I could remember, Ayers Rock, as many of us know it, had figured in my mind’s eye any time anyone mentioned ‘Australia’. It evoked wonder and intrigue but so had the Pyramids -and they were a big disappointment. (If you’ve not been, be prepared for a tourist bun fight with a lot of hassle and the suburbs of Cairo nudging up cheek by jowl with the Sphinx …) However, I was not to be disappointed; my first glimpse of it from the plane window, reassured me of its superb isolation. 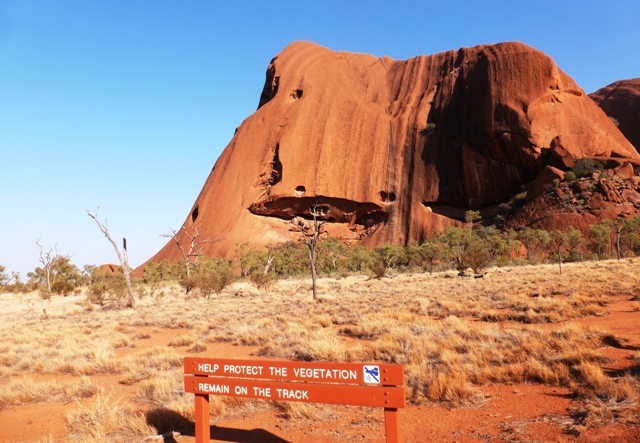 Further acquaintance enabled me to get some idea why it is such a sacred site for the Aboriginal peoples who live nearby and why it has inspired countless visitors with its impressive grandeur. Slowly a thin streak of reddy-orange appeared, the carpet of stars started to fade and the dark was gradually ushered away by the sun struggling to break through the distant layer of haze along the base of the skyline. We were transfixed by this simple, everyday event, cameras at the ready, when someone said “Look – it’s over there,” and we all turned round. There, far away on the horizon, across scrubby flat desert, was the unmistakable outline of the sight we had all come to see. It gradually came into focus like one of those old photos in a photographer’s dark room, beautifully delineated yet magically elusive. The sky morphed through a pastel palette of colour. All thoughts seemed to disappear as I sat and watched it become more clearly defined and – simply breathtaking. It’s really impossible to put into words what I felt during the time it took for the sun to rise fully and the Rock to be cleary visible in its reddish glory … but whatever it was, I suspect many others felt the same as hardly anyone said a word for a very long while. Our guide then regaled us with fascinating stories relating to the Aboriginal Song Lines and the ancestors’ journey. “As they travelled they formed the world as we know it, creating trees, rocks, caves, boulders, cracks, waterholes. These features are the physical evidence that these events really did take place; they are the Tjukuritja.” From ‘Palya! 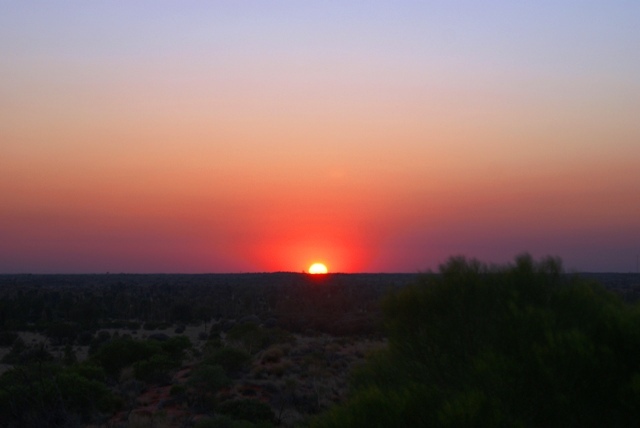 Welcome to Anangu Land’. There was a final burst of photography, we tramped back down the little hill, through the red sand and prickly grass back to our 4WD transport. The atmosphere had changed so much in just an hour. A few birds were clearing their throats and practising their dawn warble. A quirky-looking pigeony-type bird wandered in behind us to peck up our leftovers. Slightly disconcerting rustlings indicated the presence of … not sure what and wasn’t going off the path to find out. The ttransition from the cool night air to the dry heat of that extremely hot sun was taking place as we walked. It was now about 7.30am and we were heading off towards Uluru to have a walk around and learn why this ancient monolith is venerated by the Aboriginal peoples of this region. I stayed, courtesy of Tourism Northern Territory, at the Voyages Ayers Rock Resort, which is a reallya mini village. It’s the only resort in the area, but fortunately there are a number of options to suit all budgets, from camping and hostel to self-catering and the 5 Star luxury of the Sails in the Desert Hotel where I was lucky enough to stay. 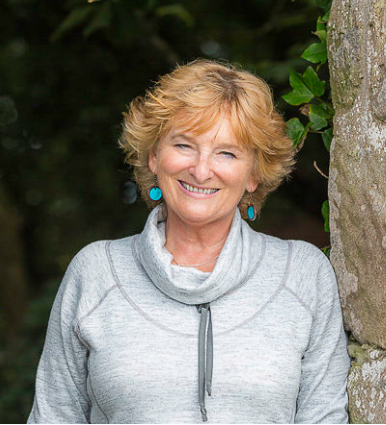 Just be warned – Bill Bryson and companion turned up without booking and there was no room at the resort – having driven all day from Alice Springs, they had to turn round and drive the 5 hour journey back and missed the Rock! 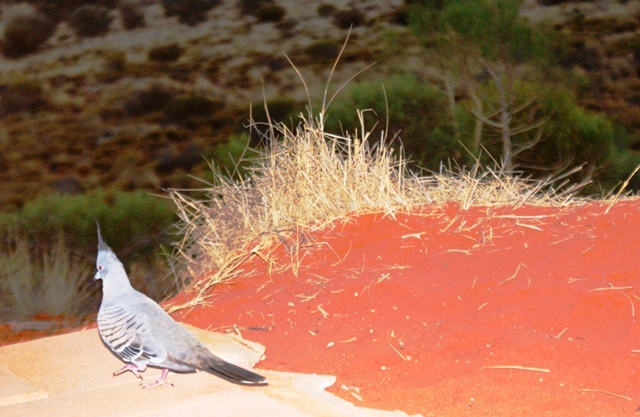 The ‘pigeony bird’ is a Crested Dove’ … quite common in Oz. My take is in instalments; the first two are at //travelrat.wordpress.com/2013/01/28/the-road-to-uluru/ and //travelrat.wordpress.com/2013/02/08/walking-around-uluru/ . Not as strong as this word-wise, but I hope to make up for it with the pictures and video (which I believe you’ve already seen) in the weeks to come. One of the most memorable days of my entire travelling life was spent at Uluru. 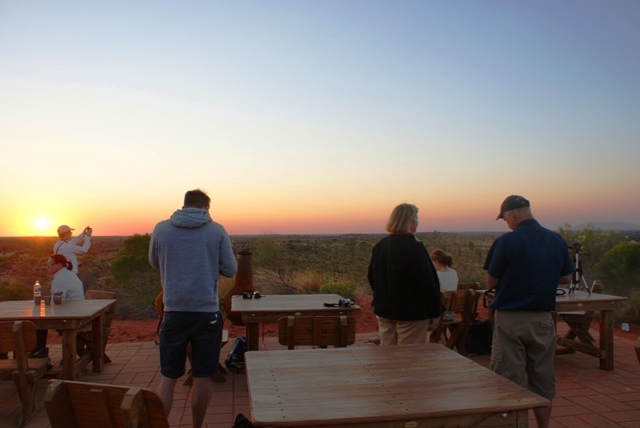 Starting off with the sunrise, then a flight over the rock and surrounding area, then the sunset, all topped off with a visit to the do-it-yourself barbecue at the Uluru township, which was great fun. Your wonderful photographs bring it all back! Flying over Uluru – what a fab way to see it Vicky. And those Aussies certainly know how to do a great Barrie! Glad it brought back some happy memories Jo and, as you say, learning more about the Aboriginal culture makes it an even richer experience. 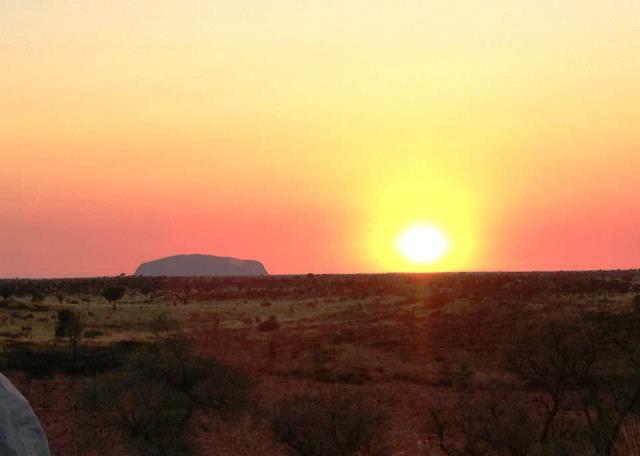 I finally got to see Uluru for the first time only a year ago and like you found it totally awe inspiring! 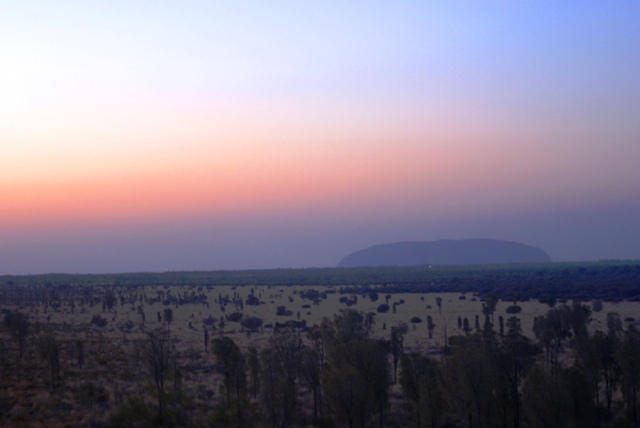 Can I share my post for when I first set eyes on Uluru? 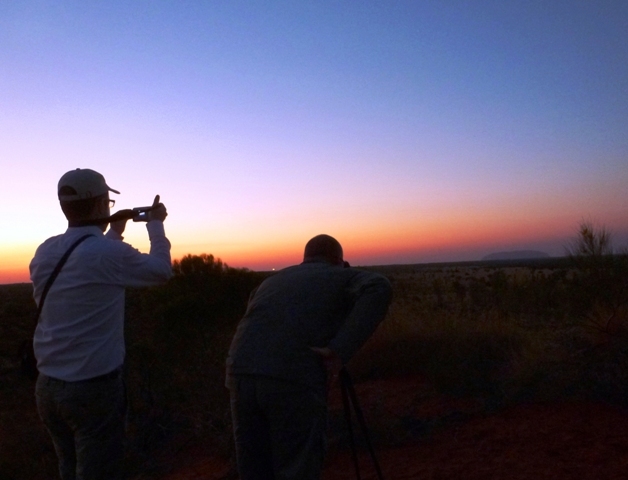 Thanks for comments DJ – it was without doubt one of the most memorable trips I’ve ever had. What a fabulous experience! Would dearly love to do this myself one day.